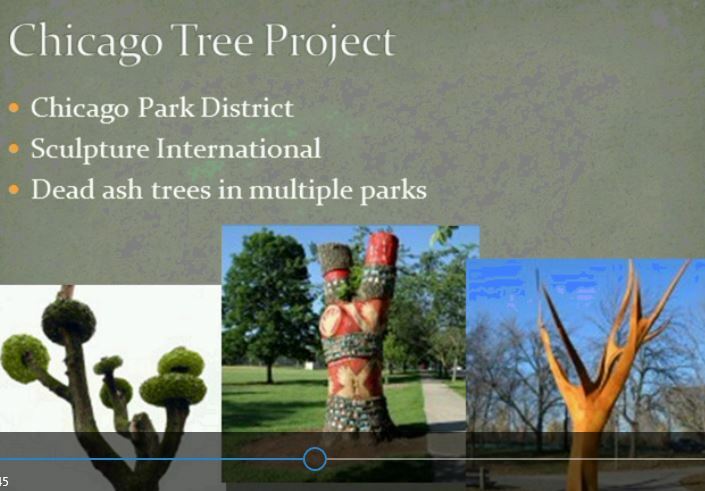 Sponsorship has its privileges for the inaugural Bringing the Urban Forest Full Circle Conference, set for Friday, March 18 at Hamburger University, Oak Brook, IL. Because the attendee registration fee for the event- $125 – is being priced at a near break-even level for the event, sponsors will be doing the Illinois Wood Utilization Team and themselves a great favor by making a modest investment in a Walnut, Oak or Ash sponsorship package. The sooner you reserve your sponsorship, the sooner you can begin reaping the many sponsor benefits. Here are five great reasons to demonstrate your support for the urban wood movement by sponsoring this unique event. Your sponsorship will be highlighted in all registration e-mail promotions, including the popular monthly Illinois Urban Wood Update. Your key contact information will be included in the conference program. You will have license rights to use the Bringing the Full Circle sponsorship logo on your website and promotions. While sponsors of any of the three levels will receive the above benefits, Walnut level sponsors also will receive a dedicated press release that will be posted in the News channel of illinoisurbanwood.org and on featured in an edition of the Illinois Urban Wood e-Newsletter. Learn more about Full Circle Conference Sponsorship / Exhibitor opportunities. Sign up for a sponsorship, which includes conference registration and a tabletop display. For additional details, contact Rich Christianson, conference director, at 773-822-6750 or richsonmediapro@gmail.com. Entrepreneurial woodworking artisan Julie McFadden launched eco Urban Timber LLC last year upon realizing the potential of salvaging high-value wood from the city of Eau Claire’s urban forests traumatic battle with the deadly emerald ash borer. McFadden’s entre into the urban wood products business was recently chronicled by VolumeOne, news from Wisconsin’s Chippewa Valley. “Ash is such a beautiful wood, and the maples and some of the other woods that are in the urban setting make really interesting furniture,” McFadden told VolumeOne. eco Urban Timber participates in the Chippewa Valley Urban Wood Project launched in 2014 as part of a collation of Leadership Eau Claire, the Wisconsin DNR and the city of Eau Claire’s efforts to encourage more recycling of dead urban trees, especially those we are anticipating being killed by the emerald ash borer. The project involves many local businesses that have joined together to provide a wide selection of sustainable wood products. eco Urban Timber sells its products on etsy. 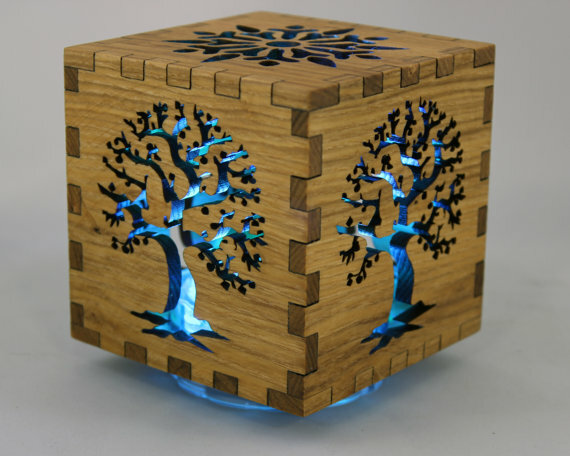 They include the Tree of Life Shadow Box, Yoga Cat Tablet Stand, Eau Claire Beer Caddy and Minnesota Wine Rack. eco Urban Timber is a member of Wisconsin Urban Wood, which is one of three grant partners with the Illinois Wood Utilization Team. The others are in Michigan and Missouri. The Northbrook, IL, company is among Chicagoland’s biggest and brightest architectural woodworking shops. Mark Bernhard, the second generation owner of Bernhard Woodwork, graciously hosted the November meeting of the Illinois Wood Utilization Team. As a decided bonus, Bernhard led a tour of his manufacturing facility where projects ranging from display cases for Tiffany’s and Macy’s to custom woodwork for a Trump Tower condo and the renovation of a historic hotel were in full swing. Bernhard Woodwork is celebrating its 50th anniversary. The company’s specialty is meticulous crafting of veneers from the careful selection of flitches and creation of perfectly created veneer sheets to layup and finishing. It’s this demanding attention to detail that founder Pius “Pete” Bernhard, Mark’s father, learned in Europe and brought with him to Chicago. But while the art of veneering is its crown jewel, Bernhard Woodwork is also highly proficient in the use of hardwoods, wood composites, glass, metals and other materials specified by designers for their projects. IL WUT members got to witness this attention to detail first-hand, while also seeing some high-tech machinery in action including a Heesemann widebelt sander that can process the thinnest of veneers without sanding through the veneer and a Komo CNC router. Bernhard took particular delight in showing off his newest “toy,” a new Höcker Polytechnik energy management system and dust collector purchased from 02 Filtration. The system automatically shut-offs air flow from machines when they are not in operation. The result has been an amazing 90 percent energy savings in the plant, Bernhard said. 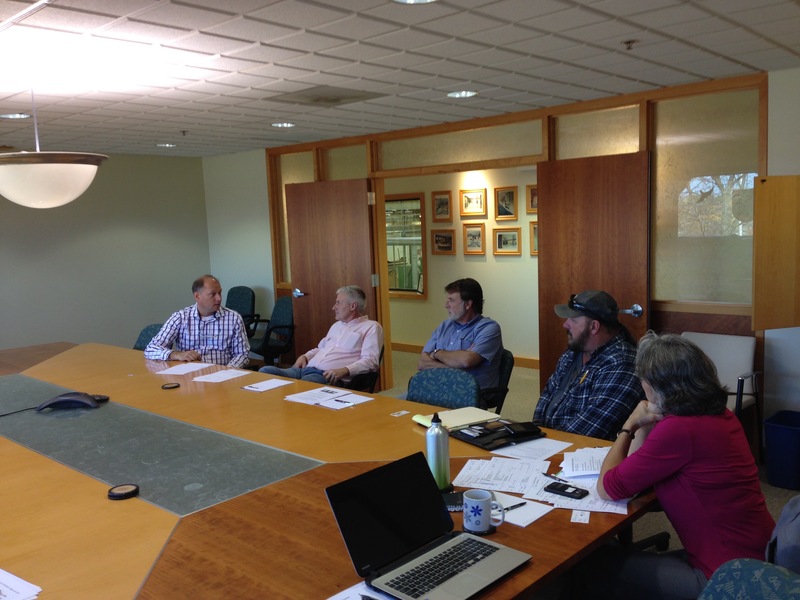 During the meeting, held in Bernhard Woodwork’s luxurious conference room, IL WUT members continued hammering out plans for the “Bringing the Urban Forest Full Circle” conference set for March 18, 2016 at Hamburger University in Oak Brook, IL. Among actions taken at the meeting, the committee voted unanimously to adopt a pentagon-shaped logo to brand and promote the conference. The logo shows five stages of urban forest renewal from removing a tree to turn into lumber for wood products through replanting. Learn more about Bernhard Woodwork. 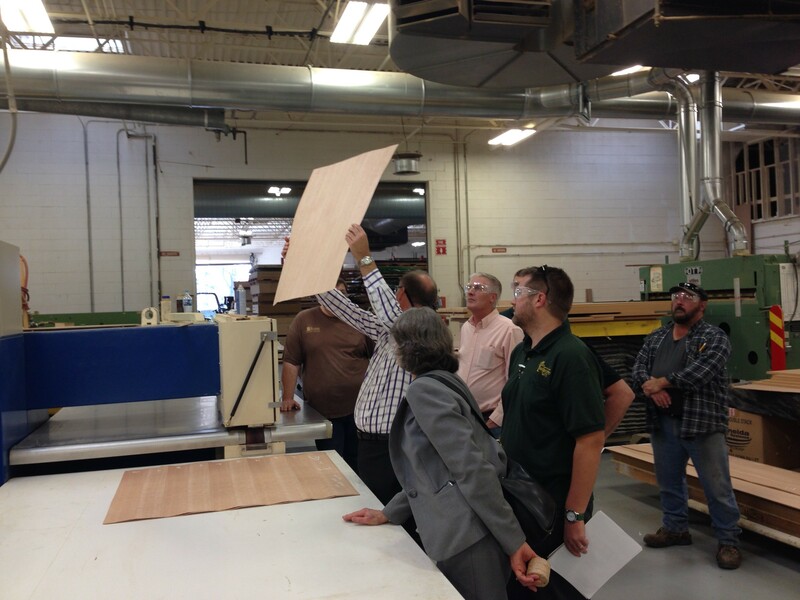 Mark Bernhard holds up a veneer sheet for inspection by his IL WUT guests. 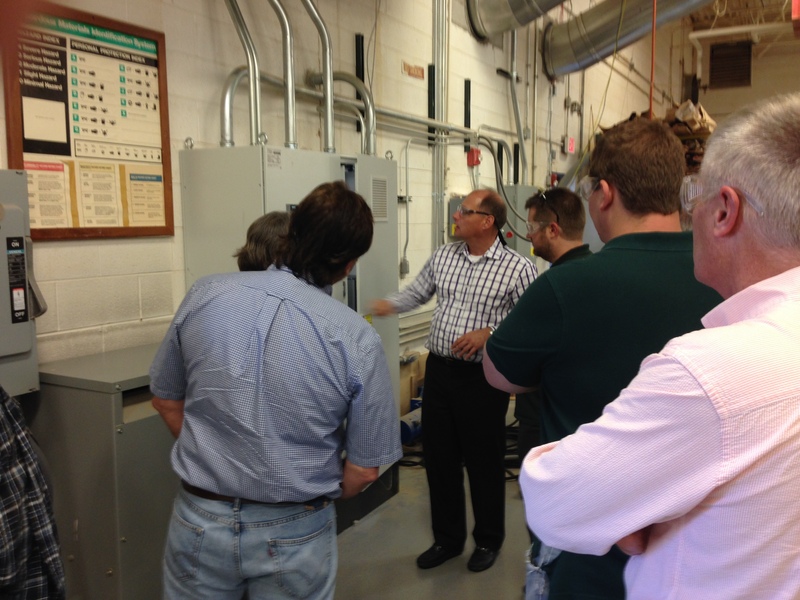 Mark Bernhard discusses the amazing energy savings his plant is experiencing since installing a Hocker Polytechnik energy management system and dust collector. IL WUT members hammer out details about the 2016 Bringing the Urban Forest Full Circle Conference in Bernhard Woodwork’s luxurious conference room. A free webcast updating wood utilization activities in Baltimore, southeast Michigan, Illinois, Wisconsin, Kansas and Georgia is available on demand from the Wood Education and Resource Center (WERC). The webcast, recorded Oct. 13, is the 10th in a series available for binge watching on WERC’s website. The first webcast in the series was produced in October 2011. Edith Makra, chairperson of the Illinois Wood Utilization Team, has been a regular presenter during the life of the series. Here’s a link to the October 13, 2015: Urban Wood Utilization Webcast. Click http://www.na.fs.fed.us/werc/eab.shtm to access the Webcast archives.